Ashley Holmes says she finished the course with new knowledge, capabilities, and a compelling PSA. When I signed up for Classroom in the Wild I wasn’t entirely sure what to expect. I knew there would be nature and I knew I would get to work hands on with equipment and for me, that was enough. What I didn’t know is I would be walking away with more knowledge about equipment than I gained from any previous class, an extremely talented new group of friends, and a 48-second PSA I’m particularly proud of. Needless to say it was a spring break well spent. The great thing about Classroom in the Wild is that even in a group of fifteen people from all different backgrounds, ages, and skills, the course is designed to give you exactly the experience you want. Jamey and Vanina did an excellent job at assisting students from the very basics of how to use a camera to setting up a jib in the back of a truck. I came into the week wanted to better understand my relatively new DSLR camera and start to learn what it takes to be a wildlife filmmaker. I finished my spring break accomplishing both of these goals and hungry for more. Beginning on day one, Jamey had us outside, each with a camera, learning the basics we needed for the days to come. I had heard all the terms before, aperture, shutter speed, ISO, but this time I had a camera in front of me and a teacher more than willing to guide me through it. I definitely step away from this experience with a lot more confidence in my technical skills but I also step away with sixteen new friends. Yes, it sounds cheesy but I can’t recall the last time I felt so comfortable in a group of people I have only known a week. I think a lot of that comes into the amount of teamwork needed out in the middle of the woods, from unloading gear to cleaning up after dinner, every person pulled their weight. After only three short days, I asked two of my fellow classmates to help me go film road kill for my PSA and they said yes without hesitation! Now that is teamwork. I honestly cannot praise this class enough, I came back with a new found vigor to succeed. My skills, confidence, and determination all reached a new high in just one short week and I couldn’t be happier. Ashley Holmes is currently pursing her MA in Film and Video, concentrating on wildlife and environmental filmmaking. She is currently interning at EIA in their communications department. 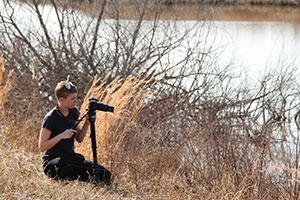 Classroom in the Wild is a one-week program offered through the Center for Environmental Filmmaking during American University's spring break on the Chesapeake Bay to introduce first-time and experienced filmmakers and photographers to the joy of wildlife filmmaking.